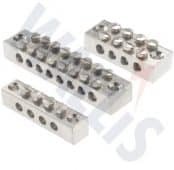 T&D distribute a full range of Earth Blocks that allow earth conductor termination, or live conductor termination within a suitable, fully insulated housing. The AN Wallis earth blocks are manufactured from tinned brass. Thorne & Derrick distribute the complete range of Copper Earthing & Lightning Protection products for the protection of electrical infrastructures, buildings and substations against lightning strikes. T&D supply DNO’s, IDNO’s, ICP’s and utility power contractors involved in the construction and maintenance of MV-HV substations – this includes duct seals for underground cable duct, cable cleats to support cables, underground cable protection and a full range of MV-HV cable joints, terminations and connectors in heat shrink, cold shrink and push-on technologies for XLPE, PILC, oil and gas insulated cables. ➡ Contact T&D for competitive prices and fast delivery from stock for Earth Blocks.